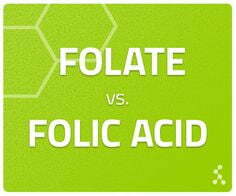 The folic acid vs 5-MTHF debate. Over the course of this year, there have been many articles about the benefits of folic acid vs L-5MTHF here in Australia and I think the writings have been somewhat one sided, so I have decided to send you my thoughts on the folic acid vs L-5MTHF debate. It is understandable that manufacturers would protect the use of folic acid, because unfortunately here in Australia we do not have TGA approval to use any of the methyl products. This still does not mean that folic acid is the best option, particularly for those with MTHFR mutations. Below summarises what we know so far in the research. Methylenetetrahydrofolate reductase (MTHFR) affects the distribution of folate and maintains a delicate balance between folate for nucleotide synthesis and those for methionine synthesis.1 Mild MTHFR deficiency occurs because of homozygosity for a C to T substitution at bp677 which occupies about 10% of North American, European and Australian populations,2 and causes MTHFR reduction resulting in hyperhomocysteinemia, methylation reduction and non-methylated folate increase. Traditional recommendation for MTHFR is folic acid supplement because it is thought that folic acid can help to correct folate deficiency. But recent research shows that folic acid may not be a suitable solution for MTHFR. Related finding and evidence are discussed as follows. It is reported that folic acid inhibits dihydrofolate reductase (DHFR) gene from various species,3,4 and the type of inhibition is reported as that folic acid inhibits DHFR in human KB (cervical adenocarcinoma) cell line as competitive when the concentration of 7,8-dihydrofolate (DHF) is high.5 But when concentration of 7,8-DHF is low, folic acid functions as a non-competitive inhibitor of human DHFR. Since mammalian DHFR is a monomer with one single folate binding site, it is suggested that the folic acid inhibition derives from two binding formats of the two folate, i.e., folic acid binding to DHFR / NADP and 7,8-DHF binding to DHFR / NADPH. In the case of high concentration of 7,8-DHF, both folates compete for the same binding site on DHFR. This report indicates that human body may have very limited ability to metabolize folic acid especially when it is in high doses. These reports confirm that folic acid does bind to DHFR gene and thus is not a suitable supplement for MTHFR mutations because it will not be able to correct the folate deficiency. In addition, it will build up unmetabolised folic acid leading to immune dysfunction. Most importantly, unmetabolised folic acid may reduce immune function. A report shows that aged female mice fed with diet containing high folic acid have significantly lower number of natural killer (NK) cells in their spleens with decreased cytotoxicity immune function.10 Correspondingly, another report shows that exposing to food fortification and vitamin supplement in large populations in the US results in high folic acid intake, which causes reduced NK cell cytotoxicity in post-menopausal women who consumed folate rich diet together with folic acid supplements more than 400 mcg per day, but not in those with lower folate of less than 233 mcg per day.11 The consequence is stronger in women of or older than 60 years and in those with higher unmetabolised folic acid in serum. It is well known and widely used in experimental setting to use higher concentration of folic acid to competitively block the binding of folate to all folate receptor in mammalian cells including rodent and human cells.12 Even though there is no report of in vivo natural folate blocking of binding to folate receptor by higher doses of folic acid, it is a risk to be kept in mind for safety and efficacy when considering folic acid in the treatment of MTHFR mutations. Interestingly, a study working on gene-nutrient interaction found that high folic acid consumption through diet leads to pseudo MTHFR deficiency when it was fed to mice for 6 months due to the fact that high folic acid in the diet reduces MTHFR protein and its activity levels.13 It results in hepatocyte degeneration because mutated hepatocytes lose their ability to accommodate lipid disturbance resulting in changes in phospholipid / lipid metabolism and altered membrane integrity. The researchers mentioned that this results may have clinical implications for people consuming higher dose of folic acid particularly populations with MTHFR deficiency. The mechanism that over-dose folic acid induces higher risk of cancer is currently unknown, but some molecular epidemiologic studies show that genetic polymorphism in folate metabolic processes, such as MTHFR, directly modify cancer risk, or indirectly modify cancer risk through interaction with folate and other nutritious components in folate metabolism.17,18,19 This emphasizes the consideration of use of folic acid in MTHFR mutations because MTHFR deficiency may amplify cancer risk. Beside efficacy differences, when comparing folic acid and 5-MTHF, folic acid is a synthetic compound with no biological function until reduced to its subsequence formats, unmetabolised folic acid starts appearing at dose > 200 mcg, and individuals show wide variations in folic acid reduction ability in vivo.24 On the other hand, 5-MTHF is a better alternative especially in those countries without folic acid fortification of foods, because it is a natural form of folate readily available in vivo for transport and metabolism, and it has no upper intake limit. 5-MTHF has its important advantages compared to synthetic folic acid. Firstly, it is well absorbed even when gastrointestinal pH changes, secondly it is bioavailable and is not affected by metabolic defects.25 The use of 5-MTHF to replace folic acid in treating MTHFR reduces potential of masking haematological symptoms of vitamin B12 deficiency, reduces interactions with medications inhibiting dihydrofolate reductase, prevents formation of unmetabolised folic acid in blood circulation, and overcomes metabolic defects caused by MTHFR polymorphism. Current situation of 5-MTHF marketing and approval is that the U.S. FDA and European Food Standard Agency approved products containing 5-MTHF,26 and thus its replacement of folic acid in treating MTHFR and other disorders is expected. 6. Sweeney MR, McPartlin J, Scott J. Folic acid fortification and public health: report on threshold doses above which unmetabolised folic acid appear in serum. BMC Public Health. 2007; 7: 41. PMID: 17378936. 10. Sawaengsri H, Wang J, Desautels N, et al. Natural killer cell cytotoxicity is reduced in aged female mice fed a high folic acid diet. The FASEB Journal. 2013; 27: 643.21. 18. Houlston RS, Tomlinson IP. Polymorphisms and colorectal tumor risk. Gastroenterology. 2001; 121(2): 282-301. PMID: 11487538.